Red Envelope makes these handsome personalized Golf Ball Markers ($24.95) and Club Links ($54.95). Psst: Use code SGIFTS20 for 20% off now. 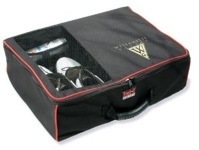 ProActive Golf Gear Trunk Organizer helps your golfer keep their car organized and their wears tidy when traveling to the course. The black one is super slick ($29.99 Amazon). 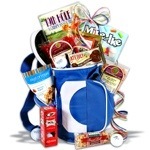 I gave my uncle this gift basket (which actually comes in a cooler shaped like a golf bag) and is stocked with yummy treats perfect to take on the course. 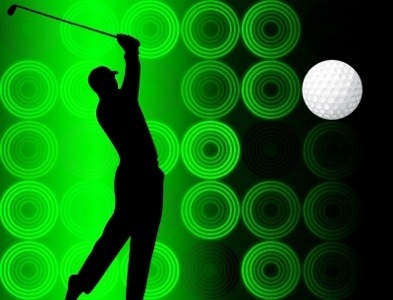 And sometimes you’re buying for a lady golfer so it also comes in pink (both priced at $69.99, Gourmet Gift Baskets). Humor: A print of a classic golf cartoon from The New Yorker is a fantastic gift. There are many to look at and the browsing is half the fun. Find them here. 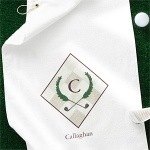 Personalized golf towels are also a nice gift, and these crisp white ones ($19.95) from Personalization Mall are a nice choice along with these bag tags ($8.95). For ladies, check out this more feminine version of the towel and bag tag. I just want to say I’m all new to weblog and absolutely savored this web site. Probably I’m planning to bookmark your blog post . You really have good article content. Thanks a lot for sharing with us your website page.